Provides an accurate, objective and reliable way of monitoring your sharpening program. By using the results of sharpness testing you will be sure that proper training methods are being employed in your knife room as well as on the production line. The Anago Knife Sharpness Tester includes software that can store and compare data, including test date and time, sharpening method, blade type, sharpening equipment operator, task blade is used for and location where blade is used. 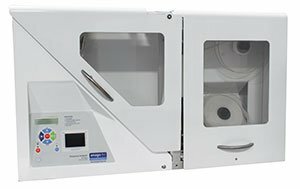 This allows you to compare the results of various tests in order to show sharpness variations between several blades, sharpening methods, and individual operators, providing accurate, objective and reliable results. This information can be used to continually monitor and train knife room staff, production floor employees and sharpening equipment. 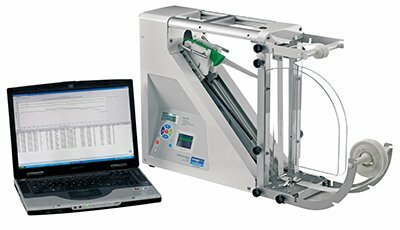 The ANAGO® Knife Sharpness Tester can be connected to a computer with a standard USB cable to display test results on your PC. • Provides accurate, objective reliable results. • Includes software that can store and compare data. • Can be connected to a computer using a standard USB cable. • Information can be used to continually monitor and train knife room staff and production floor employees. • Compare data to ensure that the most effective sharpening techniques are being used and eliminates any subjectivity of results. • Up to 80% fewer strain and overuse injuries. • Up to 1.5 times faster cutting speed. • Yield improvements of up to 1.2%. For Blades up to 8" (200 mm) long, Manual test media incrementing and pre-tension required. For blades up to 8" (200 mm) long, includes automation module. The automation module simplifies and increases the consistency through the entire testing process. 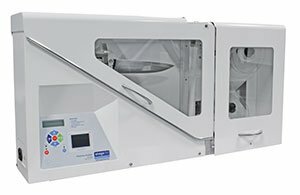 Testing with this model is as easy as loading the blade and pressing run, the test media is automatically incremented and pre-tensioned by the machine. For Blades up to 12" (300 mm) long, Manual test media incrementing and pre-tension required. 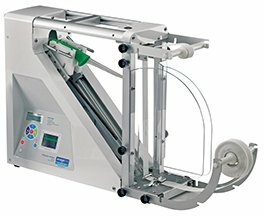 For blades up to 12" (300 mm) long, includes automation module. The automation module simplifies and increases the consistency through the entire testing process. Testing with this model is as easy as loading the blade and pressing run, the test media is automatically incremented and pre-tensioned by the machine.